Sometimes in life we have those seasons that seem to weigh heavy on our hearts. We wage war with an enemy who is very cleaver at his demises and we, in our lack of faith and trust, forget how much bigger our God is, and how much love he has for us. Life isn’t easy, it’s messy. Weather we make the wrong choices and have to suffer or own consequences or are on the receiving end of another’s bad choices sometimes life feels scary, sad, angry, impatient and defeated. Maybe it’s a phone call you never expected, an illness, a strong willed child, a wrecked relationship. I don’t know what your facing that has you isolated from God, from yourself, and from others, but I just wanted to give you hope and remind you that.. in the midst of our greatest to even the tiniest fears you have to face the God you know and have faith he is going to keep you from going under! 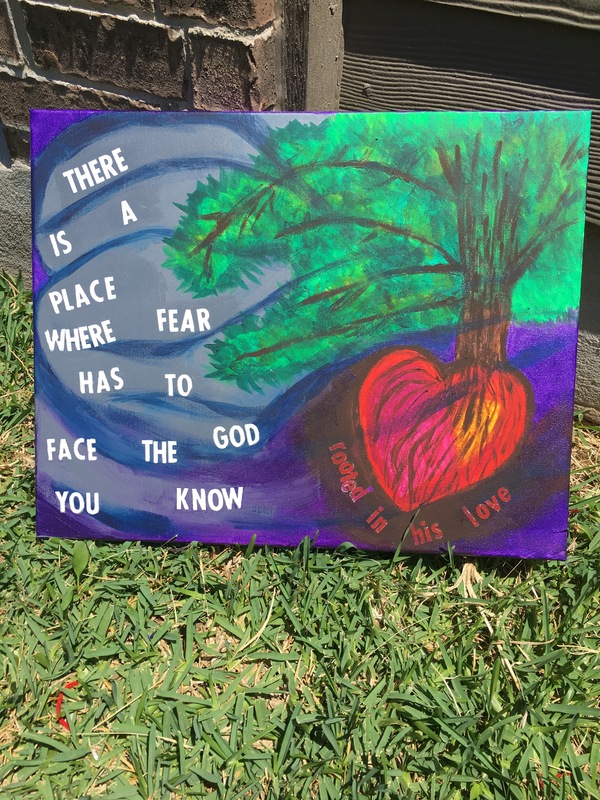 I painted this picture to remind myself that no matter how fierce the storm is raging my tree of life (my true identity) is rooted in my Father’s love and it’s enough to sustain me from hail, 80 m/p/h winds, and torrential down pours. His love saves me and his love saves you!